Manchester is a modern city with a significant history. Today is this reflected in its architecture and is it valued by local people? The Manchester tour has been an interesting experience because we could have a better understanding of its historical architecture even though the trip was just for one day. We had the opportunity to discover significant monuments such as the Town Hall, the Corn Exchange building and the Library. It brought us to places to help answer the question about the evolution of the city. We also met local people who helped us to get an idea of how people consider their city. The city of Manchester is full of diversity and it can be seen at first sight that there is a particular style of architecture. In fact, the mix between Victorian style and modern buildings can be surprising. The industrial revolution transformed Manchester into a massive cotton manufacturer that needed lots of warehouses. Therefore those buildings are protected and part of Manchester’s history. However, some places had to be renovated because of their bad condition or their impracticality in the modern world. But the process of renovation is complex because it requires transparency. We had the chance to meet Jamie Coath of Purcell architects in the Town Hall who explained how important it is to perfectly understand the history of the building in order to renovate it. The architects also use an electronic model to see the different possibilities they have. It is essential to act with transparency not to give a wrong idea to future visitors. It also has to be reasonable, so that every people can have the chance to enjoy the place. However, it happens sometimes that there is no other choice but to demolish and build something new instead. In 1996, Manchester’s centre had been bombed by the IRA. The only thing intact was a red letter box. In response to this, it was decided that they would build an impressive modern place to show they could handle such a personal attack. But, to keep the memory of what happened there, they decided to keep this letter box where it used to be. It also shows that Mancunians accord importance to the history of their city. Another example is the Corn Exchange which has been entirely renovated but the soul of it has not disappeared. In fact, they decided to make a mixture of the historical aspect of the place by letting the Corn exchange trading board remain with the final day’s closing figures and put a modern theatre in the middle of the building. What is more, Manchester has changed a lot over all these years and now is becoming a modern city with lots of skyscrapers that are contrasting with the red warehouses. However, we were wondering if Mancunians weren’t worried to lose the traditional aspect of the city. It turns out that even if everyone has a different opinion, a lot seemed confident about its future. 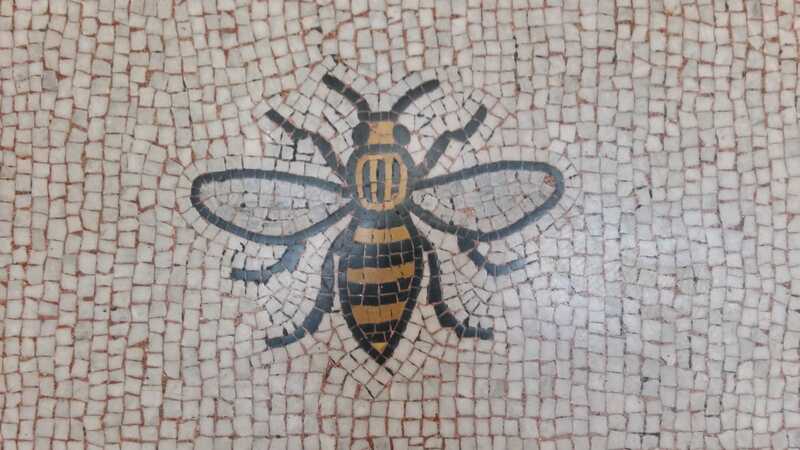 As a fact, lot of monuments are protected and as long as Manchester doesn’t become a city only made of skyscrapers, it still will be the city of the honey bee! Previous Liverpool was very proud to be designated the European Capital of Culture in 2008. How is this reflected today? This is a fantastic piece of writing and a great insight into the history and architecture of Manchester.